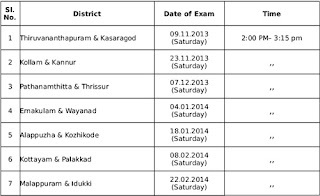 Applications are invited through 'ONE TIME REGISTRATION' facility from qualified candidates for selection to the under mentioned post in Kerala Government Service. Candidates who have already registered can apply through their profile. Note:- (1) This will include the integrated post of Lower Division Clerk/ Village Assistant in the Revenue Department. 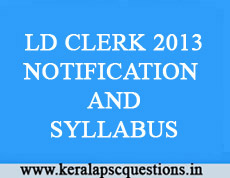 (2) Vacancies of Lower Division Clerk in Kerala Municipal Common Service will also be filled up from the Ranked List prepared for each district in pursuance of this notification without obtaining willingness from the candidates. (For Direct Recruitment only). 5. Method of appointment: Direct Recruitment. 6. 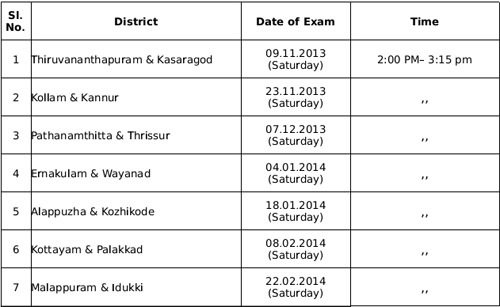 Qualification : Pass in SSLC Examination or any other equivalent qualification. 8. Last date for receipt of applications:04/09/2013 Wednesday upto 12.00 Midnight. conditions of the notification will be summarily rejected. Documents to prove qualification, community, age etc. have to be produced as and when called for .